The arrival of fintech startups in the financial market has become a potential threat for banks. Young technological companies offer customers more mobile and user-friendly services. They simplify the processes of personal financial management, taking loans, making P2P payments, or transfers. Banks do not hurry to pander to new players, but rules of the game are changing under the influence of the rapid growth of fintech startups. What waits for the traditional banking industry? What should it undertake to comply with new realities? Will fintech startups be able to force banks out of the financial market? 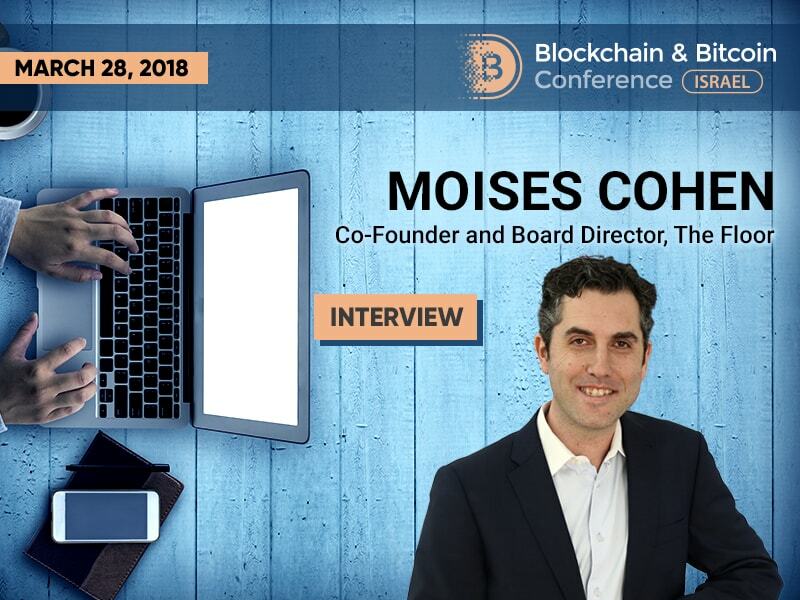 We have discussed these issues in the interview with the co-founder and director of The Floor, speaker of Blockchain & Bitcoin Conference Israel Moises Cohen. BCI: Hello, Moises! Firstly, I would like to ask how the idea of The Floor investment center emerged. M.C. : We launched The Floor a couple of years ago. The rationale behind The Floor is that Israel is not a financial capital, so we are not Hong Kong, London, or New York. We don’t have big international banks operating in Israel. But from the other side there is big demand from international banks to engage with Israeli technology and innovation startups. So we thought that there needs to be a place to go for fin technicians and that’s how we thought about The Floor. BCI: How have banks changed their attitude to fintech startups lately and why? M.C. : I think in 2008 after the financial crisis, banks realized that they need to be more efficient, reduce costs, increase customer loyalty, and customer experience and they understood that to do that they need to invest in innovation. We saw that in the last 5-10 years most of the banks created the first innovation units, some of them even corporate VCs. Also, from the startup side, at least in Israel, 5-7 years ago most of the startups were B2C, they thought they were going to beat the banks, replace the banks, etc. Little by little, they realized that is not that easy, firstly because of regulations, secondly because of distribution charges of any B2C business. Little by little, we see that most of fintech startups in Israel today are B2B. So, we move from a competition approach a few years ago to a collaboration model today. So, the new game today is about collaboration between fintech and banks. BCI: What kind of problems remain in this sphere? M.C. : I think the main challenge today in the fintech industry is that from one side you have such big and conservative institutions like banks and from the other side you have very small startups. And that today the average time in the market, from the first meeting of a startup with the bank until the solution is going to production, is two years to two years and a half. Actually, the goal of The Floor is to try to accelerate the engagement between fintech and banks and to reduce this process from years to weeks or months. BCI: There are more than 500 fintech startups in Israel. In your opinion, why is the fintech industry so rapidly developing in this country? M.C. : I think in Israel all the industries are developing very rapidly. In Israel today we have 5000 startups, 10% of them are fintech, so 500 fintech startups, 500 additional cyber startups. I think that today we have the biggest ecosystem of fintech startups worldwide, together with the US, the UK, and China. The fact that we are not a financial capital and there is not a lot of business and banking know how in Israel create a situation when people have more out-of-the-box thinking because they are not coming from the banking industry. So, that’s why I think that the fintech industry in Israel is so big. Of course, you have the support from the government, the academy, the VCs, the international banks coming to Israel, so the full ecosystem that also The Floor is creating and embracing is also creating this huge vibe of fintech in Israel today. BCI: Which technologies interest partner banks of The Floor most of all now? M.C. : Today, there is a vast number of technologies and themes that the banks are focusing. I would say AI is a very strong theme today, anything related to digital banking, mobile banking, customer experience; blockchain for some of the banks of course is also a very interesting technology, not the cryptocurrencies but blockchain as the underlying technology; anything related to reg tech, and for some banks as well, insure tech is exploding in Israel lately. BCI: How will the banking industry change in 5 years, in your opinion? M.C. : Now we are writing a report called Banking 2040, we are even more ambitious as we are trying to forecast how the banking industry will look in 20 years from now. Five years from now, it also depends on the geography you are asking. If you are asking, for instance, in Europe, so for instance for payments we just need to go to Asia to see what’s going on there with WeChat and AliPay and then we will know how it will look like in Europe five years from now. I think the banking industry in general in the next years we are going to continue seeing a consolidation of the number of banks, especially in Europe as we said we have seen in the last decade. I see the banks as a supermarket, like a shopping cart. Today most of the fintech startups even neo-banks don’t have a full value chain of services to their customers. Today only banks have the full value chain of services. The other day the bank will have a shopping cart and they will be share picking the best startups in the market – in retail, corporate banking, etc. And to build the bank of the future based on that. BCI: It’s clear why startups need banks. But why do banks need startups? What stops them from independent implementation of innovations? M.C. : For me it’s not that clear that startups need banks, but of course banks need startups. I think the main reason first of all is because traditionally banks have been developing everything in house and to develop everything in house is not very cost effective. From the other side, if they want to be the next wave of technology, today most of the Tech's Got Talent is not working at banks. If we take the case of Israel, most of the Tech's Got Talent startups is coming from people from illusionists from Israeli army. The first option is to be entrepreneurs and then maybe to work for some GAFA players. So, the banks are not the first candidates for starting to work with. So I think banks need to engage with startups to get access to cutting-edge technologies, get access to the best talent in technology in the market and together with them to build or shape the bank of the future. BCI: You are going to participate in Blockchain & Bitcoin Conference Israel. What are you planning to speak about at the conference? M.C. : I am going to talk about recent report that we published called Banking Innovation Strikes Back, where we review the history of the contributions of the banking industry since the Middle Ages, when the first bank was created in Italy, until today with blockchain. So, we cover the evolution of banking innovation in the last 500 years.